Read this word chart with your child every day. 1. Set a timer to count up. When your child starts reading aloud, start timer. 2. Mark your child's errors on the page‐protected list with a wet‐erase marker while he/she reads. corrects the word on his/her own, do not count as an error. 4. 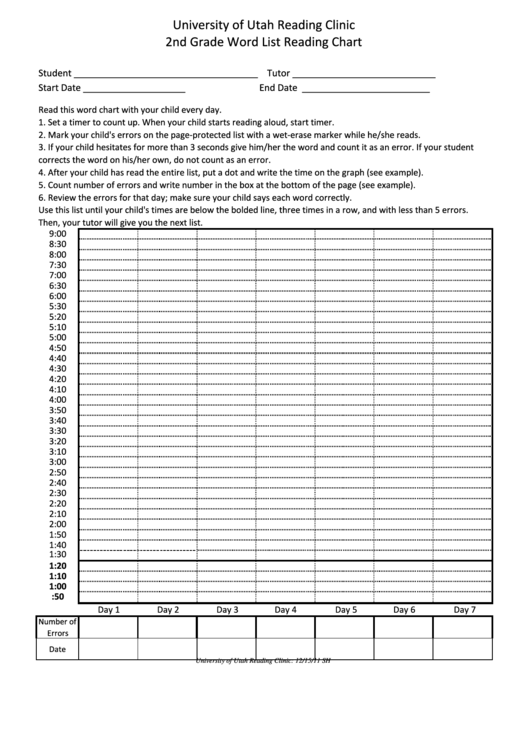 After your child has read the entire list, put a dot and write the time on the graph (see example). 5. Count number of errors and write number in the box at the bottom of the page (see example). 6. Review the errors for that day; make sure your child says each word correctly. Use this list until your child's times are below the bolded line, three times in a row, and with less than 5 errors. Then, your tutor will give you the next list.